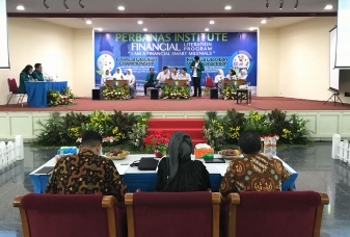 From 11th – 15th May 2018, Perbanas Institute in collaboration with the Indonesian Financial Services Authority (OJK) organised a financial literacy programme for high school students at its campus in Jakarta. 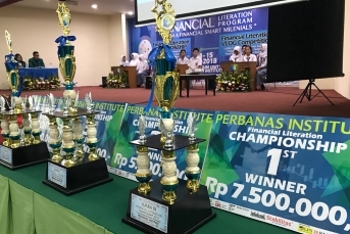 The event consisted of a visit to the OJK headquarters as well as a quiz and video blog (vlog) competition on financial literacy. 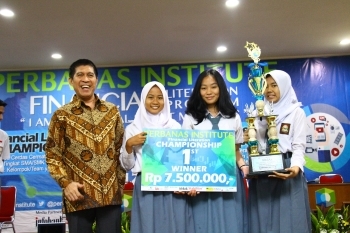 Overseeing the success of the programme was Perbanas Institute’s Vice Rector II Mr Arus Akbar Silondae in addition to the OJK’s Head of Literation and Financial Inclusion Department Ms Sondang Martha Samosir and its Deputy Director of Literacy and Information Ms Greta Joice Siahaan. The programme aimed to educate students on the importance of acquiring money management skills by teaching them to recognize the relationship between money, investments, credit, employment, taxes, and budgeting. These concepts provided students with the foundation to better understand the basic cost of living and the need to establish financial goals such as when to obtain ‘good debts’ — such as for education — and the need to avoid ‘bad debts’ — allowing bills, for instance, to go unpaid. As Indonesia's youths become financial consumers earlier in their lives, the financial choices that they make will have lasting consequences if they are not well managed. Perbanas Institute can thus help students in this regard by developing the necessary skills to be financially-savvy, enabling them to provide economic development opportunities for their local communities in the long-term.